Well this wasn't on my list of 10 things to do this summer, although I have done some of them! But I just had to join in another of Melissa's quilt-a-longs - the Star Surround. I was really pleased with how the last QAL turned out (the Starburst Quilt) and her instructions are always really good. 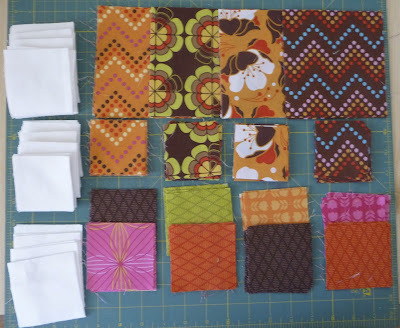 Quite a while ago I won some Heaven and Helsinki fabrics from Mad About Patchwork. I really couldn't decide what to do with them. Well now I have a project! Last week we had to cut the fabrics and here they are looking fab. That's some Kona snow as the background. This weeks task was to make some HSTs. I like doing projects like this where only little bits have to be completed in a week! Makes me smile when I feel I achieve something!